Security in Chennai has always been pretty low key. Most of the time, it involves documentating entry and exit of vehicles and people into office, commercial or residential spaces. Surveillance is by guards patrolling specific areas or by slowing down traffic to peer inside cars. Remote monitoring is unheard of, for the most part. Some traffic intersections have cameras, but the general belief is that they are incapable of taking pictures anymore. Radar guns - again, street wisdom is that one such gun is shared by all the police stations in the city. You get the idea here; security relies less on technology and more on personnel. (Or on low technology, like glass shards on walls). It is therefore surprising to find a sign saying 'Electrified Fence', especially on the outskirts of Chennai - at the Livestock Research Centre in Kattupakkam. Upon asking around, one is told that the fence is basically meant to prevent animals from entering the area; the voltage is just enough to jolt the animals a little bit, there is no permanent damage. Over a period of time, the local animals have learnt to respect the fence and so the power is switched off for the most part; it is used only very rarely, when there are some obvious security threats across the city or when there is a high-profile visitor to the Centre. I remember that one of the software companies, being an early mover on the OMR had built a similar fence years ago, for the same reasons - keeping out animals! Chennai, or even Madras, is not a city with a martial heritage. Defining battles have been fought close to Madras, but the city itself has never been overrun by invaders. Even during the tussle between the French and the British - the siege of Madras - the key objective seems to have been to take the Fort; not much of action beyond. Surprisingly though, Madras is the only Indian city to have been shelled in the First World War (will come back later with that story). The average Madrasi has been far removed from military invasions, Mughal to Japanese; even the present day 'incursions' affect him only peripherally. But Madras has its share of heroes through the ages. This circular marble structure, with a 'victory' pillar in the centre was built sometime after the First World War, to celebrate the defeat of the Central Powers. After World War II, the purpose was modified to honour those from the Madras Presidency who had fallen in action. The inscriptions in Tamil - வெற்றி - reads 'Victory', with the dates of the First and Second World Wars, also in the same script. The practice continued after Independence; the 1962 Chinese Aggression and the 1965 Indo-Pak War also find mention on the monument. I couldn't spot any of the subsequent wars - but that could also have been because I was in a hurry to get back to my car, which was haphazardly parked near a gate of the Port of Chennai! What with all the bomb blasts in Bangalore and Ahmedabad over the past few days, taking photographs in public seems to be a rather adventurous pastime. In Chennai too, police have been placed on the alert. Thankfully, that does not seem to have hampered the regular activities of the city; things seem to be going on just fine. Including the afternoon showers. A couple of sharp spells last afternoon cooled down the city without seriously inconveniencing anyone. The dark clouds put the raintrees to sleep earlier than usual, so when the sun came back at around 6 o'clock in the evening, it had a little more space to shine through on to a damp Eldams Road. Wish things could stay this way, without threats of bombings or retaliations! Having posted a few pictures taken from the top of this building (the docks, Esplanade and the High Court), it is time that I revealed the building itself. So here is a shot of Dare House, the corporate headquarters of the Murugappa Group, one of India's oldest and most respected business houses. There was a time 250 years ago, when the French under Thomas Artur, comte de Lally, apparently camped at this site. That was during the siege of Madras in 1758, when the site was used as a base to mount cannon attacks on Fort St. George. But that's not the reason why the location is named 'Parry's Corner'. And it is not a corrupted spelling of the French capital city, either. The story of Thomas Parry and his businesses, most notably in partenership with John William Dare, and how those businesses came to the family of Dewan Bahadur AM Murugappa Chettiar is far too rich and fascinating to be contained in this post - so I'm not even going to try. While Thomas Parry's name lives on in the name of one of the companies of the Murugappa Group, his partner is remembered in this building. But all this history does not stop several people from referring to the junction of NSC Bose Road and Rajaji Salai as 'Paris Corner' - or sometimes even insisting that it is 'Paree Corner'! Was walking down Lloyds Road - as a part of one of Nizhal's Tree Walks, more about them some other day - when I saw this frangipani tree, thick with flowers. And along with some childhood memories, unanswered questions came back. The memories are of two kinds: being lured to the plant by the sharp scent of its flowers, picking the fresh ones, punching a small hole in each petal to fold them back over the stem of the flower and ending up with a yellow-and-white ornament. Of course, as a kid rushing to make more signet-rings than the others, plucking the flowers was an essential part of the routine. But in the villages, there was always frustration at children playing with these flowers. A belief that the scent of these flowers attract the spirits - and snakes - during dusk meant that we were all frisked thoroughly for our ornaments before we were let back inside the house. The name of the plant was also intriguing; it sounded so very Indian with the 'pani' ending (that ending denotes 'bearer' in many Indian languages), but it also sounded delightfully foreign, when you twist your tongue over the 'frangi' bit... and knowing that it was an imported plant added to its charm. Of course it had its local names, too - so many of them, in fact, that I do not remember even one! But searching for a connect between the etymological roots of 'frangipani' and 'fragrant' has got me nowhere. I guess I should be happy to just walk under the plant, enjoy its fragrance and be thankful that it is there! Chennai's suburban rail network has always been a watered down version of its Mumbai counterpart. The latter carries almost half of the city's population every day; even with Chennai's significantly lower population, less than a third of them use the suburban trains. For a long while, Bombay and Madras were the only 2 cities in the country that could boast of a vibrant suburban train system. Delhi's was largely unused and Calcutta clung on to its trams. Then Calcutta went for its Metro and Delhi bested it with a world-class system of their own. Chennai's trains continued to run; a new line was added, the older ones were upgraded - all incremental changes, nothing that was front-page stuff. The old lines: Central - Tiruttani, Central - Gummidipoondi/Sulurpet, Beach - Tambaram, were among the oldest tracks laid down in the country. While the first two run out to the northern suburbs, the Beach-Tambaram line goes through the city for the most part and connects up its southern reaches. Here's one of those trains coming up to Beach: it has just left the Park station and now has to turn left, to skirt the western edge of the Fort St. George complex, heading towards the Fort station, its last halt before the Beach terminus. The bit of water at the bottom left of the picture is a part of the Cooum river; looking at its shrivelled and polluted state today, it is hard to believe that this was once a natural moat for Fort St. George! I don't know about others of my vintage, but the first time I read the Ramayanam and the Mahabharatam, it was in English. Maybe some of the charm of the epics was lost in the reading; but having had to listen to grandmothers reciting them in the vernacular, a verse a day (or so it seemed) one was impatient to find out What Happened, rather than listen to discourses on How To Behave. And Chakravarthi Rajagopalachari (Rajaji) was the man who helped me in that quest. He translated both those great works into English, keeping the essence of each canto but going off on his own interpretation of how they defined / prescribed correct behaviour. But that was only to be expected from one who was Gandhiji's sammandhi*; this man, the only native Governer-General that India had. After India became a Republic, he was a minister in the Union Cabinet for a short while, but then came to Madras in 1952 to become the Chief Minister of the (then) Madras state. He was by all accounts a man with several bees in his bonnet. Prohibition, Kulathozhil kalvi (schooling for half-day and learning the family trade during the other half), Hindi as a compulsory language - all of these, imposed by him, were seen by the people of Tamil Nadu as an extension of Northern hegemony and repression of the lower classes. And so, his Chief Ministership was short-lived; he resigned in 1954 and went into a tailspin of sorts; the second half of his life was a story of petty rivalries and pot-shots; certainly not lived in a manner befitting one of the earliest recipients of the Bharat Ratna. This statue of Rajaji stands half-way along the long road that bears his name. But it is tucked away to a side, just like an old relative whose glory days are cherished by the family, but is today too embarassing to be included in a gathering of the clan! *Rajaji's daughter was married to the Mahatma's son; that's a rather complicated way of saying they were sammandhis! Somehow, I've never felt a need to take my car to someplace just to have it washed by a machine. And I haven't known anyone in Chennai who has actually done something like that. I am sure there would be folks who have; but unlike for the Loch Ness monster or the Sasquatch, we don't even have grainy photographs showing folks swerving their vehicles furtively into this MRF Tyredrome on Cathedral Road. And the more or less dry floor does not support the theory that Automatic Car Washes are Minting Money in Chennai. MRF can probably afford to run this along; it is rumoured that they charge Rs.200 a go; for that money, you have machines cleaning the inside and washing the outside while you get to wait in the lounge. And anyway, this is just a talking point for MRF, they're into other, bigger things. (Yes, they're the same guys who advertise on the outdoor thermometer of an earlier post). If they'd at least let people sit in the car while it is washed, it might have been interesting for kids to see it from the inside. But for the kind of money that they (are rumoured to) charge, I can have someone come in every day for a month to wash my vehicle - he might even agree to wash the undercarriage, something that urban legend says this MRF Tyredrome does not do! Would love to hear if you - or anyone you know - has used this. Any stories? My first thought on seeing so many people wearing black t-shirts with an 'X' marked on them was, "Oh, another protest march!". Blame it on the political climate in India over the past weekend when everyone seemed to be protesting against everything. But then I kicked myself for not remembering that the 'X' was Roman; it was the 10th year of the Chennai Citizens' Run. I just caught the vanguard of the Run; schoolchildren wearing the t-shirts over their school uniforms and still seeming cool. The celebrities were probably waiting for the sun to go down a bit further before beginning their Run - that makes sense; the early runners can wait in the cool evening to see their heroes, more non-runners will be on the beach and might contribute to the causes supported by the Run. Even though it has been a low key affair since it began in 1996, the Citizens' Run has helped garner support for over 40 Chennai NGOs. When one thinks about it, Chennai has quite a few runners, though not so many large scale events; apart from this Run, the Chennai Marathon is probably the only other well-publicised running event. However, there are those niche events by smaller groups like the Chennai Runners who had their ECR Run on Sunday (these folks need a daily dose of endorphins: they run at least 5 km every day except Mondays), or the Hash House Harriers - they have both Chennai and Madras versions (well, they do run, even if you think they are more focussed on what happens after the run). So the next time you see a bunch of people in t-shirts running towards you, don't panic. Move to a side, wave them along, and if you want to be extra careful, hide that bottle of beer! For me, it is Sunil Gavaskar who began the practice of asking the umpire for a fresh guard when he reached his century. That's probably factually incorrect; it is something that almost any batsman will do, every once in a while during an innings. But since Gavaskar scored more test centuries than any batsman before him, he had more opportunities to do it in the public eye. In a sense, today's post follows this habit; having reached a hundred, I looked for a fresh start - without having to do away with all the previous posts! And that's where this milestone helps. Considering its significance, there should be some kind of monument around it. It stands quite forlorn, without anything to indicate it's significance. And it's location, almost at the apex of the railway overbridge on Muthuswamy Road is not a convenient one to build any kind of elaborate marker. Apparently, it is the norm for highway engineers to locate the 'zero point' of a road at a place where there is no possibility of overlapping roads; for them, the zero point of a road is just a technical indication. This milestone is considered the zero point for the three National Highways in Chennai; though only NH45 (to Trichi) is marked, NH4 and NH5 (to Bangalore and Kolkata respectively) also begin here. From a historic perspective, the zero point of Madras was within the walls of Fort St George; and convention then was to measure distances from the gates of the Fort. I have not had an opportunity to go inside the Fort for a long time. Maybe the next time I do, I should look to see if there is any memory of the 'Zero Point', which was once the centre of Madras! And so, this building. In some of my earlier posts, I have mentioned how a shot of this building was enough to establish that the hero had arrived in Madras - whether the movie was in Tamil, Malayalam or maybe even Telugu. It remains (I think) the tallest building in Chennai. The construction of this building was begun in 1953 - the design inspired by the United Nations Headquarters in New York - by M.Ct.M.Chidambaram Chettiar, who dreamt of it showcasing United India Insurance, Indian Overseas Bank and Travancore Rayons, three of his big business ventures. Chidambaram Chettiar died in 1954; his dream for this building died a couple of years later, when the property, belonging to United India Insurance, was taken over by the government when insurance was nationalised in 1956. Having always seen this building from Mount Road, I did not think I could ever have a different view of it. What I did not realize was that the property has now been extended all the way back to General Patters Road; it is not easy, as you drive up GP Road to figure out how the 'Golden Jubilee Gateway' takes you to Mount Road - it is only when you go a little beyond that you get to see the building itself and then it becomes clear. When I got this view of the LIC Building, I knew that it would make the 100th post - the building where both my parents spent a significant part of their working lives! In most commonwealth countries, the lowest level of the justice system is the Magistrates Court. Most of the cases that come up here are of the type where the presence of a judge is necessary to carry out the bureaucratic processes that are a large chunk of legal proceedings - remand of suspects, swearing of affidavits, issue of warrants - all those little bits of paper that add up to the might of the law. At 8 am, the buildings are shut and sleepy. As the time for the courts to begin their day approaches, the pavements wil be filled with all kinds of touts, lawyers, police constables, small time criminals hoping to either advance or retard the wheels of justice. I don't think it is a fun place to be unless you have a good idea how to work the system - or if you're just there to take pictures! The Chennai Port is 127 years old this year - or so they say. It is one of the quirks of this city that the Port's anniversary does not actually mark the commencement of the day the Port was open for business; rather, it marks the anniversary of a severe storm that completely washed away the first 2 L-shaped breakwaters built to provide a safe harbour. Work on these breakwaters commenced in 1876 and was almost complete when the storm wreaked its havoc in November 1881. Besides the breakwaters, the railway tracks used for transporting construction material, the cranes and some of the other masonry work on the docks was damaged beyond repair. It took about 4 years before work on building a permanent harbour commenced again and it was completed in 1896. As a counterpoint, the first pier of the Madras Harbour was in operation as early as 1861 - that would make the Chennai Port 20 years older - but storms in 1868 and 1872 damaged it so badly that it became unfit for use. And even before the pier was built, the fishing village of Chennapatnam is reported to have had a rough road out into the sea, serving as a pier, as far back as the 1630s. Be that as it may, until the harbour was ready, ships to Madras would drop anchor about half-a-kilometer out to sea and cargo was transported to land using lighter boats called 'Masulas'. Today, the Port has specialized docks - it handles about 12% of India's iron ore exports through a dedicated ore handling plant and receives Suezmax category oil tankers to feed the refineries in Chennai - and was also the first in the country to set up a dedicated container terminal facility which is among the top 5% of such terminals worldwide. Chennai might not have a romantic seafaring tradition - which makes it all the more creditable that it has overcome the disadvantage of not having a natural harbour to hover in the list of the top 3 ports in India, year after year! Went a bit further down the dead-end I had written about in an earlier post. No, I wasn't looking for anything specific, it was just that there was no parking space near the building I wanted to go to. There wasn't much to do for it, but park the car further deep into the street. Didn't notice this board first; actually, I did see it, but dismissed it as one of those omni-present signs saying "Do Not Park in Front of the Gates". It was bit later that I realized the sign was - most probably - intended to warn children playing cricket in the street, to not hit the ball into the walls. Despite what it says, I am sure the person who had this put up on her* gate must have a wry sense of humour. At least, she* seems to be playing along with all those childhood stories. If you remember, the rakshasan/ogre/troll never waits at the near end of the bridge/road/forest: the hero has to go to a point-of-no-return before the ground thunders. Bringing the ball back after hitting it into the grounds of a house is a dull task. Imagine how deliciously exciting it can be if the ball has to be retrieved when you know the house is inhabited by a fire-breathing demoness! * Don't you agree with me that this livens up the game quite a bit? The name 'Abbotsbury' today brings to mind the block of apartments on CP Ramaswamy Road. But there was a time when Abbotsbury was the hall of choice for hosting celebrity weddings. Somewhere along the way, the stars crumbled around it and the owner - one of the founding partners of Tarapore & Co. - willed it to his company on his death. For some reason, Tarapore did not develop the property and it lay vacant until it was gifted away to the Sai Baba of Puttaparthi. The Sai Baba also did not appear to be interested in holding on to it and the place was sold to the Balaji Group, promoted by Magunta Subbarami Reddy, a Member of Parliament, in 1994. The Balaji Group began construction of what was rumoured to be a "7-Star Hotel", at a time when the category was non-existent. The Oberoi Group, with their experience in running luxury hotels, was to manage the property and so it came to be known as the 'Magunta Oberoi'. However, when Subbarami Reddy was murdered by Naxalites in Andhra Pradesh in December 1995, the Balaji Group lost direction; the Magunta Oberoi project fell through. Every once in a while, there would be a report that a hospitality major was taking over the property. Over the past dozen years the names that have done the rounds include Intercontinental, Hilton and Hyatt. Now, there are two banners across the gates - one claiming 'Ramani Hotels, Mumbai' to be the owner and the other staking the claim of 'Robust Hotels'. Through all this, the building still stands half-constructed, with its glass paneling facing Mount Road hiding the unplastered bricks at its rear, hoping to someday add 323 rooms to the Chennai hotel market! PS: The title of this post is in some sense inspired by my fellow Chennai-daily-photo-blogger Ram's post about the same building! Not really, it is more like a small pond. 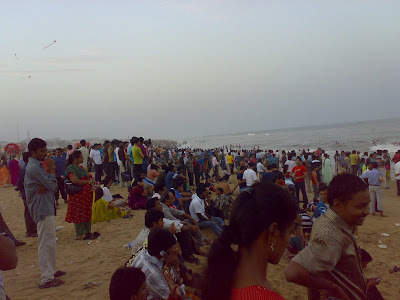 On our way back from Mamallapuram on Sunday, we had stopped at the Elliots Beach in Besant Nagar. We tried to get off our vehicle close to the spot where I had taken a photograph of 6th Avenue a few weeks ago; but today, there was no place to park and so we drifted down a bit further towards the southern end of 6th Avenue. It didn't get any better, so we just went ahead and jumped on to the sands and walked the short distance to the waterline. As we got closer, I realized that the soft roar was not the sound of waves, but the chants of those getting their feet wet in the waves. It is not usual for people in Chennai to go swimming at these beaches; the bottom apparently drops abruptly after about half-a-kilometre, and the resulting undercurrents can be dangerous. So, there were only a few men who had ventured more than 10m into the water - and they were the ones most excited by the waves tumbling them over. I saw this as a chance to build up the average number of people-per-photograph. It is also a nod to those like Kris, Ravindran, Ram, Magiceye and Sherry, who found their perceptions of Chennai being shattered by that earlier photograph - folks, there are still some crowds in Chennai! It is criminal to visit a World Heritage Site without a camera; I got away with it because my cell phone has a decent one! Had gone to Mamallapuram on Sunday, the trip being inspired by friends visiting Chennai. As we walked around the monuments, I realized it was the first time that I was seeing the Shore Temple after the tsunami of December 2004. The name of this town, about 60km from Chennai, is a tribute to King Narasimhavarma Pallavan's prowess as a wrestler ('Maha Mallan' = great wrestler). This tribute is a recent one, dating from the second half of the 20th century. For hundreds of years after King Narasimhavarman, the town was called Mahabalipuram, and is identified by that name in UNESCO's list of World Heritage Sites. But Mahabalipuram calls to mind a religious myth and the atheistic political climate of the 1960s could not stand such a reference: a more local heritage needed to be honoured. 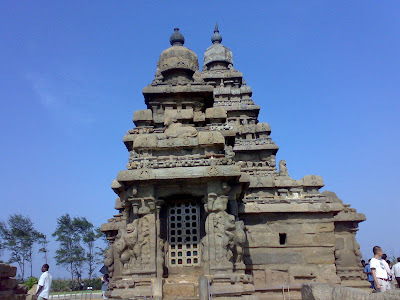 (Some scholars believe that the Pallavas were originally the Pahlavas of Persia, but that's too tenuous a connection, so Mamallapuram satisfies requirements of local heritage). The shore temple is magnificent, built on bedrock that rises from the sea. It is believed that there were once 6 such others - but the earliest documentation of this is from 1798, when John Goldingham, later to be the first official astronomer of the Madras Observatory, wrote down the local legends he heard. The tsunami of 2004 provided a tantalising glimpse of what might be: some who were on the beach when the sea withdrew reported sightings of another temple, and a stone lion was uncovered when the sands were washed off from it. The Archeological Survey of India does not have any recent update on its post-tsunami investigations. Until they find - and then manage to relocate to the surface - another temple, the Shore Temple will remain a singular monument! Vegetarianism used to be quite the norm in Chennai. Even today, there are some landlords who would not let their houses out to folk who eat meat - apart from the belief that meat-eating causes man to absorb animalistic tendencies, they do not like the idea of the kitchen being used as a mini-slaughterhouse. By and large, major taboos around eating meat have faded out and with vegetarianism coming back into 'fashion', it is far easier to resist peer pressure, whether your preference is for the vegetables or the meat - unlike the past, where non-vegetarians would deny such tastes and vegetarians would get defensive about their choices. Fashionable vegetarianism has opened up more options for dining out. 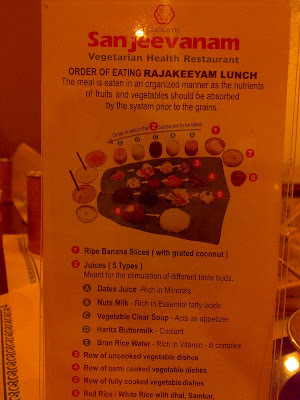 Apart from Saravana Bhavan and its clones, there are a few others that have tried to pick up vegetarian niches; one such is the Sanjeevanam restaurants, which have gone uber-vegetarian, by introducing a lunch menu, where courses are served - and are expected to be eaten - in a particular order. Unlike other thali lunches, where you can eat the dishes on the side in any order you choose (and ask for multiple helpings), the Rajakeeyam lunch regulates what you eat, too. Though at first look, the portions appear small, the restaurant ensures you are well fed by the time you finish your payasam (dessert). Took this picture of the lunch menu when I had gone there for dinner once. Though dinner is good, I would prefer to go there for lunch, despite the possibility of having to wait a while. There is one peculiarity that many might find irritating; the waiters enforce it as a strong suggestion and I think it is good practice to follow it, but quite a few people ruin their digestion by being irritated at the denial of what is a basic necessity. That's right, Sanjeevanam strongly recommends that, if you are going for the Rajakeeyam lunch, you keep your water glass unfilled until you have finished eating! There are still a few streets in Chennai that have more houses than flats. It is always a pleasure to go into such a street, because one gets to see sights that are unique today, but were commonplace a couple of decades ago. And when the street is a dead-end, it makes for some added excitement - because you know you don't have the excuse of 'passing through'! Early last morning, I went into one such street in Abhiramapuram. Okay, the excitement was slightly lower, because I had a good reason to be there. It was nice to see that the practice of washing the space in front of the gates and tracing 'kolams' in them still continues - that's something one can't get to see in front of a flat. And because it had rained a bit during the night, the street had a misty feel to it, the fresh mist that foretells a crisp day. And then I saw this colourful sight. These tricycles have almost disappeared with the advent of all the big, corporatised retail stores. They are the last link in a chain that has connected farmer to consumer, getting the vegetables from the field to the table within 24 hours more often than not. Unlike the big stores, this chain does not have any fancy infrastructure or management overheads; no storage facilities or refrigerated trucks. It runs on links that fragment the produce at every stage, making sure that there is no need to carry inventory. And it works because there are still many wives and mothers who do not believe in storing vegetables in their freezers - they want them fresh, every day. 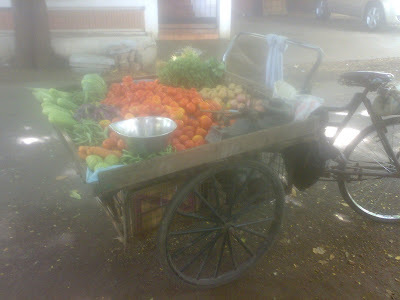 And these tricyles bring such vegetables right to the gates, dispensing of 250g of tomatoes, a 100g of beans - just enough for a household to be fed that day. And these retail specialists probably know much more about their customers' preferences than any store manager can find out from his databases! On a few of the afternoons during the last week, parts of Chennai had the 'showers' - an ominous build-up of dark clouds, threatening a deluge to break all records, followed by gusty winds that chase most of the clouds away. Invariably the clouds, being sore losers, dump some of their content in a quick burst and for about 15 minutes, visibility is down to 20 metres, the bike riders and pedestrians rush to the nearest tree or store-front and wait until the clouds finish their showing-off. Having a car, I'm luckier and keep going my way. One afternoon, it was still dark as I passed this bakery. Not having much of an overhang, it is not a favoured sheltering place for those caught by the rain. That day, the contrast between it's interiors and the dripping, gloomy street was stark; the brightly lit inside was almost beckoning me to enter and pick up some of the fresh muffins that they normally stock every afternoon. It was tempting; they are really good bakers and I like their products - but the raindrops were large enough to deter me from stopping for them. Still, the memory of the smells and warmth inside the bakery kept me company until I reached my destination! PS: Magiceye, thank you for the 'Araldite & Ford Cortina' - once I got the word 'Duralite' into my head, I couldn't think of any other brand! It is said that Indians speak rapidly. Even so, the consumer boom of the past few years had brought into being a new class of quick speakers - those who speak the fine print. To protect market participants in recently decontrolled insurance markets, the regulators for insurance and for mutual funds imposed quite a bit of mandatory declarations on any advertisement material - "Insurance is the subject matter of solicitation", "Mutual funds are subject to market risks", "Please read offer document carefully before investing" being the most commonly used phrases. It is funny enough to hear these words running into each other so as to take up less than 1.5 seconds of a 10 second radio ad spot. But the virus spread to other places, too; the neighbourhood grocer started putting in signs saying "Potatoes free (conditions apply)" and spotting the fine print, whether in the written or the spoken form, has become a challenge. This sign on the wall of the LR Swami building at the intersection of Cenotaph Road and Mount Road seems to be predicting a day when those 3 little whispered words would be followed by four others, said in a much softer tone - and if you are used to picking up what those "Mutual funds blah, blah, blah" announcements mean, you can surely catch on to what 'Terms and Conditions Apply'! My memory of the 6th Avenue at Besant Nagar is that of a wide road, crowded with every demographic category that inhabits Chennai. There was always a variety of everything - age groups, genders, clothes, colours, you name a parameter and you could get both extremes and a lot in between, if you were hanging out along 6th Avenue. The road itself runs parallel to Elliots Beach for about a kilometre-and-a-half. That's a straight stretch, where the motorcycles could show off their pick-up, speed or any kind of calisthenics its rider was inclined to do. And hey, if you were cool, you had to be there on Sunday evenings. It is surprising how some of those images refuse to go away, even after quite a few years. The Sardar at Cozee Corner reeling off Tamil far more fluently than I could; the lone policeman trying to get a look at the number plate of an RX-100 that did a more-than-usually-noisy wheelie; young couples shutting out the rest of the world by staring ardently at each others' toes as they walked the length of the road - all of these jumped into my mind's eye as I neared the beach on a Sunday, a few weeks ago. But it was morning, not evening. 6th Avenue was deserted. Even Barista, with its orange board bright in the sunshine, seemed to be drooping off. But it was nice to see it this way. Now I have a reason to come back some other Sunday, in the evening and see for myself that nothing has actually changed on this street! 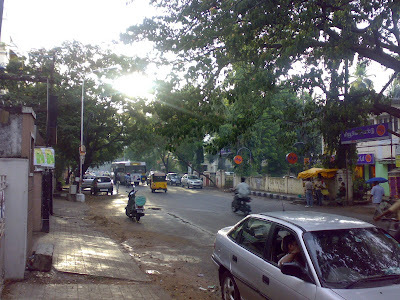 One of the most undisturbed areas within Chennai city is the contiguous stretch of scrub forest that runs across quite a bit of the Guindy area. On the northern side of Sardar Patel Road, the forest land has been carved up into small bits; with further landscaping, the character of the greenery has changed completely and makes for nice viewing through the PWD offices, the Anna University and the CLRI. On the southern side, however, a large part of the forest land was protected by it having been made a National Park. And with only two other institutions (the IIT Madras and the Raj Bhavan) on either side of it, the Guindy National Park (GNP) continues to be part of the great green lung of Chennai. Not everyone gets to go into the GNP; it is actually somewhat wild and it is quite easy to get lost inside! However, a small part of the Park is given over to the Children's Park (set aside under instructions from Jawaharlal Nehru, India's first Prime Minister) and the Snake Park (which was the birthplace of the Madras Crocodile Bank Trust - a bit more about that here). Both these are very popular - not all the criticism they get is justified, though they can be run much better - and are therefore crowded almost every day. And in the company of excited kids, adults might also turn adventurous and go through gates without realizing where they lead to. This sign, next to a gate opening out from the Children's Park into the 'wild' part of the GNP, helps to warn off such well-meaning but ill-equipped adverturers! I really didn't have too many excuses to not visit The Landmarks of New York. My best excuse was trumped when these landmarks came to Chennai; and they came so close to where I work, that I could not miss them even if I wanted to. There were about 80 of these landmarks, all in black and white, framed, with descriptions on the cultural, historic or architectural significance of these. All of them were photos taken by Barbaralee Diamonstein-Spielvogel, who was at one time chairperson of the New York City Landmarks Preservation Foundation. The photographs themselves were excellent, but what was more impressive was the idea of a 'Landmarks Law'. In essence, a building that's over 30 years qualifies to be a landmark, if it can be demonstrated that it has a lasting cultural, aesthetic or historic value, is declared a landmark and protected from demolition. All the while, the owners of such buildings can continue to use and maintain their properties. Today the New York City Landmarks Law covers not only buildings, but also signs, neighbourhoods and public use land. Maybe the existence of such legislation could have deterred the state Public Works Department from demolishing the 250 year old Government House last month. The demolition went ahead with only a few protests, mainly because the building was set back inside the Omandur estate, shielded from public view. There are many more such vulnerable structures in Chennai, that could well do with the protection provided by a 'Landmarks Law'! On May 12, 1978, Mr. Vivek Kunte brought together sixteen of Chennai's nature enthusiasts together to form the Madras Naturalists' Society. Not much is documented about the early days, but the Society has grown to about 300 current members, whose interests span almost every aspect of nature and the environment. Over the past 4 months since I joined the Society, there have been quite a range of events: a birdwatching basics camp, two 'Tree Walks', a couple of field trips, participating in a census at the Guindy National Park - I end up feeling sad that, despite joining this Society with all good intentions, I'm still not able to take out time for all the varied activities that are on offer. Yesterday was the formal (mandated by law) annual meeting of the Society. The accounts for the last financial year were accepted, the Society's office bearers elected and some animated discussions on its direction for the next 30 years were conducted, over a couple of hours. But by the time we thought about taking a picture, many of the members had left - so here are those who stayed on to continue talking about all kinds of flora and fauna! Oh yes, I know this is not an original idea. The concept has been around for a while now. I can't remember when this one first came up, but I am sure that the idea for this hoarding came from an ad for some adhesive brand where a car was stuck to a billboard. I used to remember both - the car as well as the adhesive - brands and now I can't recall either! Google has also failed me this time. Does anyone know what I am talking about? It's okay if you don't because you can then substitute this one. Hindustan Motors manufactures some models of Mitsubishi cars for the Indian market; they also manufacture some earthmoving equipment for Caterpillar. In front of their sales office, they have stuck one of each - a Mitsubishi Cedia and a Caterpillar backhoe loader - on low hoardings. As you drive in to the city from the airport, the car is easily noticed; the Cat is slightly hidden from view and you have to know where to look if you want to see it. But that still doesn't take away the question... where did I see this before? PS: Ottayan, Dan, Ravindran, Magiceye, Ram - I've figured out what that 'football' was all about - and I've updated that post! Chennai, through the last 50 years or so, has been quite non-experimental in its architechture. There was so much sameness about the buildings, residential or commercial. All buildings were blocks. I would love to build up evidence of inspirational building design from Chennai, but I am hardpressed to think of examples. Which is a big reason why I like this building. Anyone who is remotely familiar with designs of Tamil Nadu temples will immediately recognize the sweep of the gopuram as being the design kernel for this building. Even you are unfamiliar with the temples and their architecture, the building's name - Temple Tower - gives you a major clue. Taking off from the Chennai airport, the flight to Bangalore heads out in north-easterly fashion. Looking out from the cabin, as you try to spot familiar landmarks, Temple Tower soon comes into view. And I know that the moment you are able to spot the clock face on top of the building, it is time to make a left turn: a-ha, I make a good pilot! The Tamil Nadu state government website lists only 15 'embassies' in Chennai - some of them are honorary consuls, but only one is listed as such. The website of the Union Ministry of External Affairs lists 25 honorary consuls as being present in Chennai. Neither of these websites have updated the events that led to this small board coming up on Nungambakkam High Road at the end of May 2008. The Hindu did report the setting up of this honorary consulate. Mr S.R.Krishnan, who occupies at least part of the 2nd floor of Rosy Tower, has been described as the "the right person in the right place at the right time" by the High Commissioner. It took a bit of poking around to find out that Mr. Krishnan is a Director in a steel company. He must have been engaging quite a bit with the country - it is heartening to find that someone in Chennai has been doing so much work in Zambia, that the country has appointed him its honorary consul here! Something more than 'very fine'? When this sign came up outside a house on Chittaranjan Road, it seemed like someone had started a part-time business from a garage. Within a couple of days, the same sign was outside a shop on Eldams Road - now it looked like they meant business! But expanding so quickly? Discovered later that M'zuri Sana - the internet tells me it means 'very fine', but I'm sure I was given a different (and better sounding) interpretation of this Swahili phrase at the store - is a chain founded by a person from Jodhpur, with stores in many cities. That was surprising, but more surprising was the variety of merchandise that was on display, from lampshades to garments. Quite a nice range to look at - and the people at the store let you take your time. I will be back there soon, even though I have a crib about the store. With a name like M'zuri Sana, one walks in expecting to take back something distinctly African. But every one of the items is robustly Indian in design - and all of them have been crafted at M'zuri Sana's Jodhpur workshops! It had to happen. Over the past couple of months, there have been reports - and rumours - of petrol bunks refusing to pump regular petrol, but forcing people to buy the more expensive premium brands. Erratic supply of petrol and diesel had resulted in stock-outs at a few of the bunks. However, since Monday evening, the fuel supply system to the city was thrown completely out of whack. Vehicles began to tank up, fearful of running dry; seeing the queues, more vehicles joined them, 'just in case'. Last morning the queues began early; by about 9 o'clock, traffic had become completely messy, with everyone trying to squeeze into the nearest petrol bunk. Apart from the traffic police, other units were also brought in at some bunks to protect them from the wrath of the waiting crowd, when they actually emptied their stocks. Things were looking somewhat dangerous as other cities in the state also began to report shortages. Thankfully, the fevers eased off a bit with the announcement that about 25% more fuel than normal was being sent in to Chennai on Wednesday - and also the news that a tanker with 30,000 kilolitres of diesel was berthing at Chennai port on Tuesday evening. I wonder if all the trucks had gone directly to the docks for their fuel supply! In the days before all citizens became fitness conscious, the only folks who jogged were either athletes or military servicemen. For the troops stationed at the St Thomas Mount cantonment, the hill near their barracks must have been a challenging objective - they would have taken bets on racing each other up and down, showing off their fitness! For a while, the hill was one of the stations of an annual cross-country run. The church authorities did not mind it as long as it was once a year. But the fitness wave of the 80s washed up a lot of huffing, puffing, sweaty joggers to the top of the hill; the churchmen then decided to turn them away, at least from the immediate surroundings of the holy shrine. And that rule continues to hold today. So - no bending or stretching as you walk in through these gates, ladies and gentlemen! And if you would like to browse the complete list of participants, here it is!